Istanbul has color — this neighborhood in particular. Last week’s record store photo and this week’s Kebab House are within a few blocks. 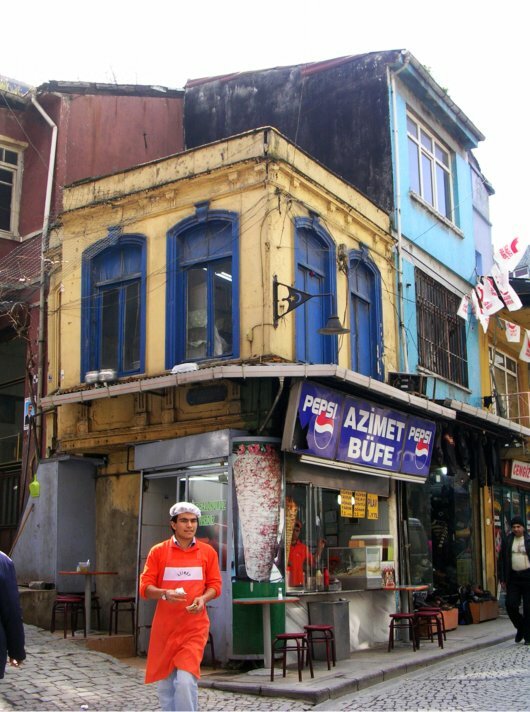 As I looked up to see the colors of the buildings at the corner, I saw the kebab shop employee walking towards me in his great orange garb. He moved so quickly that his feet didn’t make it into the shot, but the orange of his outfit travels back into the shop, where the other employee eyes me. The scene seems to drift back to the right. You notice the kebab sign, the real kebab in the window, the Turkish crescent moon in the light fixture above, and the same image in the white and red flags floating above advertising a political party for the upcoming elections. I can’t believe it – I’ve actually been there on my last shawarma pilgrimage. Absolutely delicious and the place gets really busy at night. Did you eat there or did you just savor the aesthetic? Linda, this photo is terrific. I love street photography and you captured a great moment.